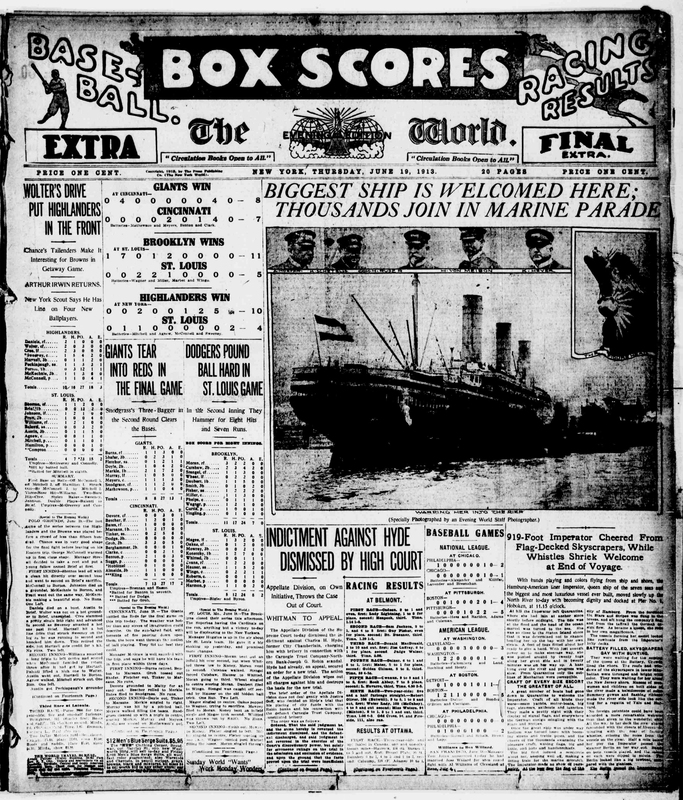 To the New York World on June 19, 1913, the arrival of a brand new ocean liner at Hoboken’s pier 1 was a front-page event, but only one of many. After all, if a newspaper calls itself The World, it ought to be responsible for the history of everything. For the moment, however . . . 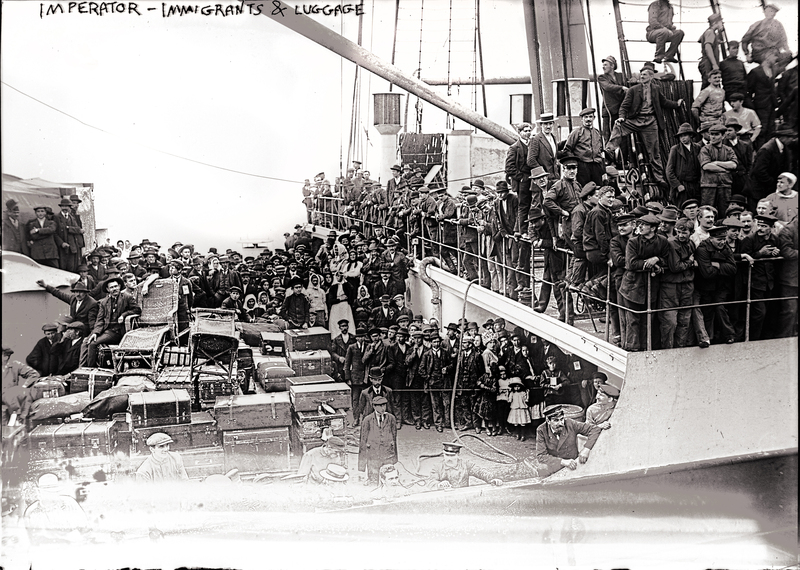 The phrase seems to equate the immigrants with the trunks they carried. Some people have sailed into the historical record along with boxes covered with the skins of dead horses or dead cattle. That, literally, is what “Immigrants & luggage” means. Of course the caption-writer’s intent probably wasn’t scornful; presumably he was only trying to keep his caption as short as possible. 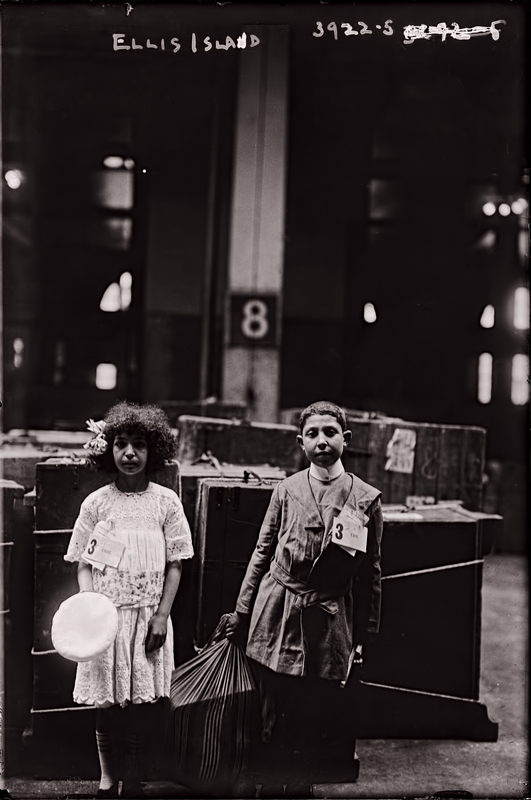 Adding one more word and possibly replacing the ampersand with another — “Immigrants and their luggage” — might have altered the caption to a text both syntactically unambiguous and emotionally rich, but it would also have competed with the emotion that a news photograph is generally supposed to communicate on its own, without words. 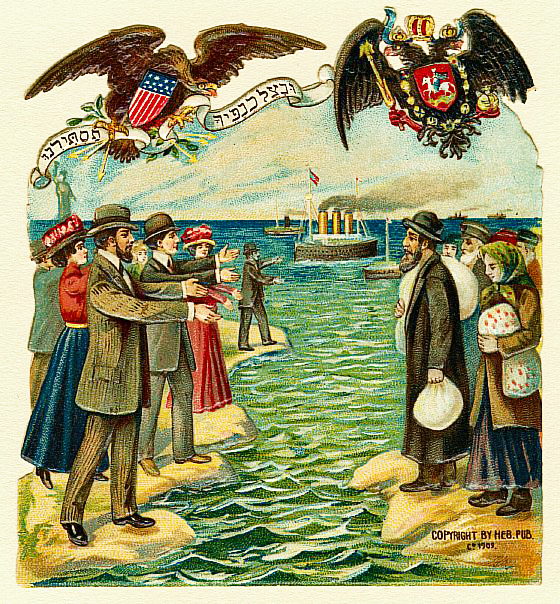 In any case, this image dates from 1913. The time for learning to read it richly, with the resources that irony can provide, won’t arrive until some time later. In fact, a whole series of times will soon be on the way, and each new time — say, 1914; and then 1924, when the golden door at Ellis Island was slammed shut; and then, of course, 1945 — will offer us one more tip for making a read text or a seen image seem fascinatingly complex. But for now in 1913, you have been granted the innocent luxury of reading an image almost free of its associated words. The words are there to be read, but as of 1913 they’re still pale and faint. They haven’t yet been hardened or darkened. They aren’t yet mature enough to withstand and repay an ironic reading. Come closer, then. These words and this image can be remembered without distress. 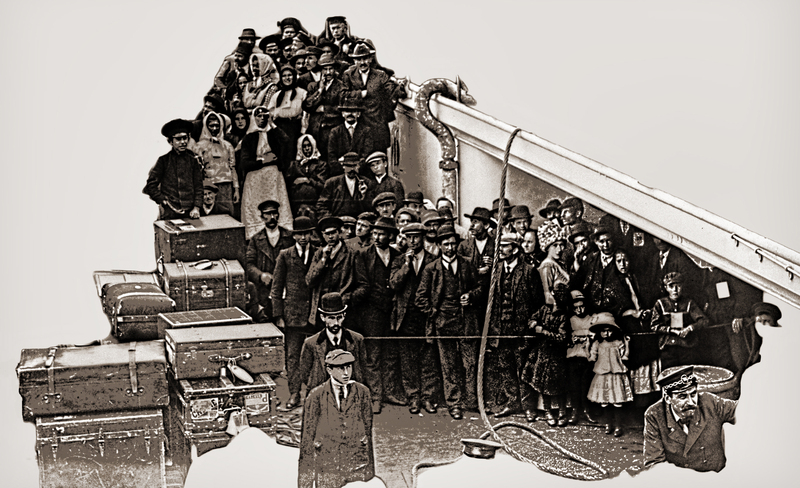 If you are an American of central or eastern European descent, the probability is high that your ancestors crossed over on one of the ships of the Hamburg-American Line. Of the faces you see now, as you remember, one may be yours. The ship that gave your face its meaning for The World in 1913 has vanished into the unrecorded, but in its vanishing it has bequeathed you an image of the life that will be yours. Now think of what was about to happen in 1914 in the world you left behind. In the new world your news has been better. Think of The World slipping out of its press, evening after evening ever after, to redeliver that better news: the news you are rereading once again, the news that you were a passenger on the Ark. Sources: George Grantham Bain Collection, Library of Congress, http://www.loc.gov/pictures/item/ggb2005013360/ and http://www.loc.gov/pictures/item/ggb2005013520/. Photoshopped. Source: George Grantham Bain Collection, Library of Congress, http://www.loc.gov/pictures/item/ggb2005022285/. Photoshopped. 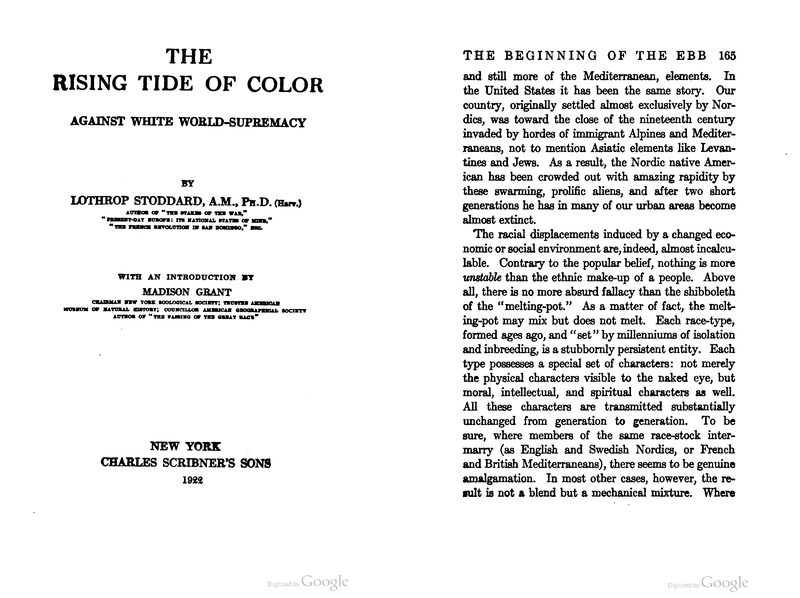 In The Great Gatsby, the title of the book that disturbs Tom during the summer of 1922, The Rise of the Colored Empires, by “Goddard,” is an accurate topical reference to Lothrop Stoddard and the propaganda campaign that resulted in the Immigration Restriction Act of 1924. Aslant on a tilted surface, a ship’s steel curves align themselves into a complex array of near-verticals and are changed from a simple prow into a Richard Serra multiform. 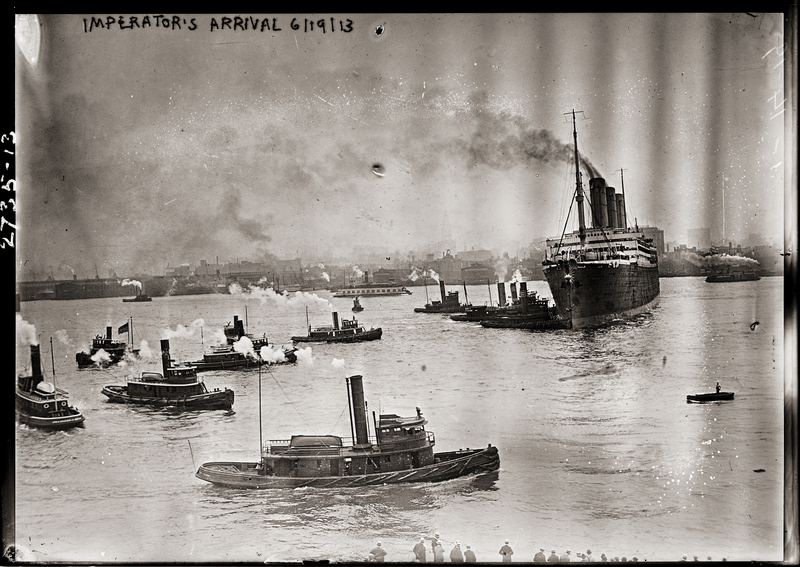 Emitting excited puffs of steam as they prepare to nuzzle the new shape, the ship’s companion tugs bustle into line as merrily as if they were executing poses for the jovial approval of Raoul Dufy. As in the sunny vacationland France of a Chelsea gallery, all here in New York harbor is innocence, luxe, and the thoughtfully capitalized beauty of gaits trained by dance. The big ship and her brood of little boats seem to have prepped for their appearance before the camera in a boutique full of Lartigues. 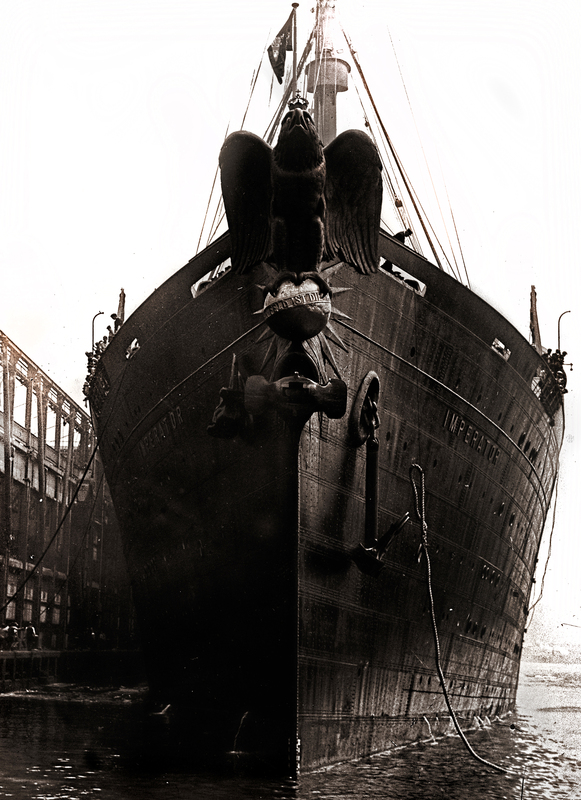 There, after the primpers undercoated the sky with pink and the water with blue, they finished off the big ship’s funnels with a dramatic application of buff. A hundred years ago, that tint at the source of cloud was a form that hope had chosen for an emblem. 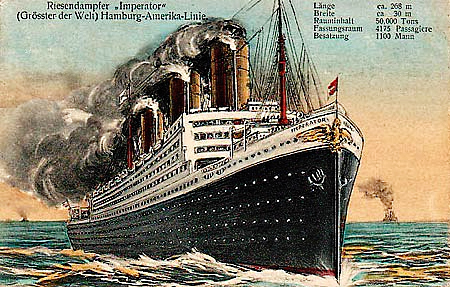 Buff cylinders multiplied over water were the insigne of the Hamburg-America Line, the most important transport link between Europe and the United States for the desperate Jews of Russia during the last years of the czars. Imagine you can hope now in the way they hoped then. In the mind’s eye, see a yellow glow travel from right to left across the ocean. See it take on readable form as water and sky unscroll before it. When the ship with bright funnels comes into its haven, its passengers will disembark into the boutique’s chosen range of the spectrum and commence a different way of being seen. All three images have been Photoshopped for contrast and tone.